This always feels like it’s supposed to be part of the “punishment” for failing at the fight. But yes, it’s horribly annoying. Alternatively, with slowly scrolling text, at least have a tap-to-display-at-once option. This is a little bit of an issue in 9th Dawn II, combined with the super-long dungeons. On the plus side, it made grinding quicker. This is my pet hate. After playing through hours of a gaming and building my skills and levels, I don’t want to feel like a Level 1 player again. I’ve done the hard graft. I don’t want an Endgame Boss (at least on Normal/Easy/Casual mode) that takes two dozen attempts to kill and an intricate strategy that’s nothing at all like anything else earlier in the game. And often this fight is impossible, if there’s no further way to level your character. 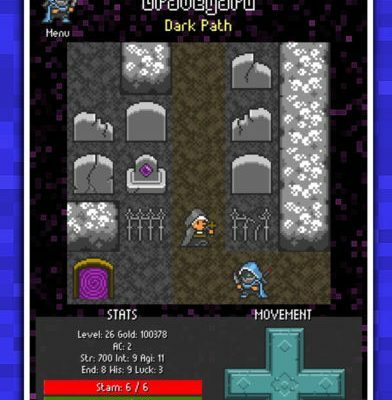 MazeQuest was an otherwise-wonderful recent game with an unbalanced final fight. This was a little bit of an issue for me in 9th Dawn II, made worse by the total lack of automap. Conversely in the Adventure to Fate games I played recently, there was a marvellous portal-in, portal-out system so you could get to the temple and merchant. Anyone else got any pet hates about features (or lack of features) in RPGs?